Nokia Lumia 800 for Sweden, January 23rd 2012. The Nokia Lumia 800 is coming to Sweden, starting from January 23rd 2012. Initially, the Lumia 800 was brought out just to 6 countries at first but gradually more are trickling in. …Nokia Lumia 800 will launch January 23rd. Following carriers has Nokia Lumia 800 available to pre order now, and shipment is schedueled January 23rd. It is Telia (Sweden’s biggest carrier), Tele2, Telenor and Three “3” (Sweden). Three Sweden is promoting it on front page of their website, that’s nice to see. In the pressrelease, Nokia says pricepoint will be on 3900 swedish krona (437.71 euro), but of course every store and carrier can decide for themself. Three is selling the phone for 4500 swedish krona without contract, that is about 504 Euro. Nokia Lumia 800 is Nokia’s first smartphone based on the mobile platform Windows Phone from Microsoft. The highly anticipated mobile phone will be sold by all the Swedish operators and will be available in Swedish stores from and including 23 January 2012. 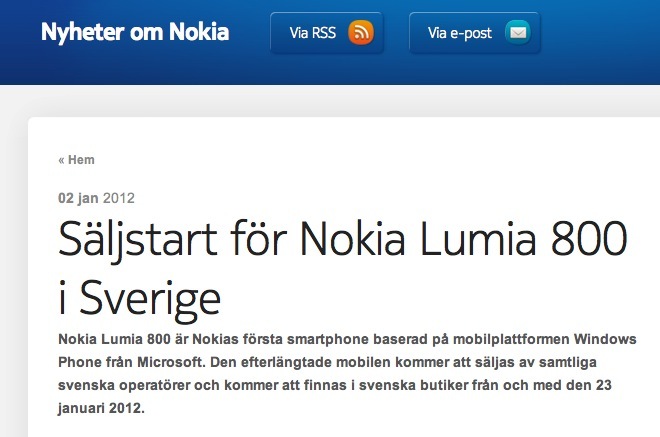 Today Nokia announces säljstart for Nokia Lumia 800 , Nokia’s first smartphone in Lumiaserien. Nokia Lumia 800 has a modern, stylish design and familiar Nokia features such as leading camera technology combined with flexible web solutions and Internet Explorer 9. Nokia Lumia 800 makes content more alive with social features that make your everyday life. The Nokia Lumia 800 managed social networks with a single movement and contacts are managed easily with integrated communications wires and group divisions. – This is one of our most anticipated products ever and it feels very good to our Swedish consumers finally get to meet Nokia Lumia 800, said Jo Harlow, Markets, Nokia. Navigation The Nokia Run offers a complete and free navigation service with an interface designed for driving with turn-by-turn feature. New Nokia Lumia 800 also introduces music service MixRadio as part of the Nokia Music. MixRadio is a global streaming service that offers hundreds of locally relevant music channels at no extra charge. With the operating system Windows Phone 7.5 Mango is Nokia Lumia 800 designed for people with a rich social life, which estimates that easily and quickly share their everyday lives. – The Nokia 800 Lumia gets Windows Phone visible to the public at large. Nokia’s total focus on Windows Phone has resulted in an amazing phone, unique both inside and out – a phone that everyone will want to have, says Peter Wissing, Business Area Manager, Windows Phone. Nokia Lumia 800 will be sold by all the Swedish operators from 23 th January 2012 and is estimated to cost around 3900 SEK in the store, excluding taxes or subsidies. To complement with an optimal music and audio to Nokia Lumia 800 Nokia introduced the Nokia Purity HD Stereo Headphones by Monster (on-ear) and Nokia Purity Headsets by Monster (in-ear), developed jointly with Monster Cable. These headsets are expected to be available in stores simultaneously and is expected to cost around 2000 SEK (on-ear) and 1000 SEK (in-ear). Cheers Hussein for the tip!